Behavior Problems Are Bugging Me! Spring is just around the corner, and my room is all decorated with flowers and leprechauns now! We are still in the midst of book making fever, and now they are writing “chapter books.” This means that at random places in the middle of the book, they are inserting the words, “The end” and then continuing on the next page! One of my little sweeties kept referring to his work as “Tractor One” and “Tractor Two” rather than “Chapter One” and “Chapter Two.” I love it- too cute! 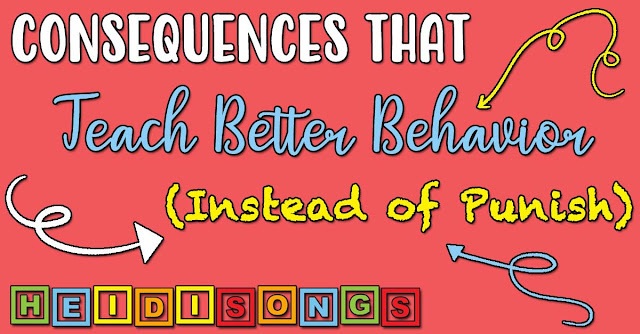 Now for this week's post- Behavior problems are BUGGING me!! 1. 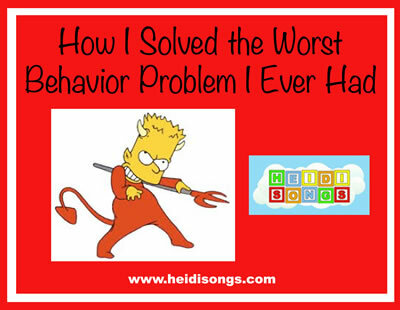 How I Solved the Most Difficult Behavior Problem I Have Ever Encountered! A couple of years ago, there was a mom that requested me to be her child’s teacher because she had heard that I was a very firm and no-nonsense kind of teacher. And lucky me- I wound up with a child in my class with the most difficult behavior problems that I had ever encountered after about 23 years of teaching. Even two months into the school year, this little girl was still refusing to join the group, rolling around on the carpet at the back of the room, yelling and screaming at random times, pushing and hitting other children, etc. She was even expelled from the school Day Care after two weeks because she pushed a child off the monkey bars and broke the child’s arm. She always claimed that someone was being mean to her or refusing to play with her, but when I watched her carefully throughout the day, none of those things ever occurred except in her imagination. She had a host of professionally diagnosed problems, including ADHD, ODD, (Oppositional Defiance Disorder), and Bipolarism. The poor little girl was just about as angry and messed up as you can possibly imagine, and nothing I tried worked at all with her. When she did sit in her spot on the carpet, she was usually rolled up tight in the fetal position. Other times she just rolled around in the fetal position from her spot to wherever she could roll during lessons. I called for help from the office as much as I could, but they were about as powerless to help her as I was, and of course eventually had to return her to my room. Her mother did want to help, but had few skills or resources and lots of excuses. The child was medicated for her issues, and had been for some time, and occasionally she came in looking like a zombie and just fell asleep in a corner. The first time this happened, I sent her to the nurse and the nurse asked her mom to pick her up because she must be ill. The mother’s response? “WHAT? You don’t get paid if she’s asleep?” After that, (unless she was running a fever,) I just put her in my loft with a pillow and a blanket, and let her sleep until lunch time. After more than two months of struggling with her in all of my usual ways to get her to comply, I had just about had it. I set out to “prove” that she couldn’t even behave for five minutes, so I set a timer. I said, “Let’s see if you can behave for just five minutes.” Every time she misbehaved (unless she was hurting somebody,) I ignored it other than saying, “That’s not what I am looking for; I want you to do this....” and I described what I wanted or pointed to a child that was modeling the desired behavior and simply reset the timer for five minutes. It took us until after lunch time when she finally made it through a full five minutes. When the timer finally went off, the whole class broke into cheers! I never told them to do this; I think they were just as tired of it as I was, because she was making it so that I simply couldn’t make it through a single lesson. Even the child herself stood there with her mouth agape, amazed at the fact that she had made it and was receiving some positive reinforcement from her peers and her teacher! I congratulated her on her success, (even though I suspected she was just plain exhausted and enjoying the story I was reading,) and invited her to come up and put a rubber stamp on an index card that I happened to have handy. She loved that, and of course the other children wanted one, too. I was more than happy to oblige! I gave everyone as many rubber stamps on their hands and on index cards as they liked until they got tired of receiving them. I reset the timer and asked if she could do it again. Sometimes she hit the mark and sometimes she did not. But that day, she went home having earned a little bit of genuine praise and approval from her peers, and she was clearly much happier. After a couple of days of the timer going off every five minutes and putting stamps on index cards with more and more success, I decided that I would make a formal behavior contract for her that would show which times of day she was earning the stamps and when she was still having trouble, etc. We continued with the timer going off every five minutes for at LEAST a month! Yes, it was very disruptive, but not nearly as disruptive as having her constantly misbehaving and having to deal with THAT as an interruption to my lesson instead! Incredibly, the children, (bless their little hearts,) continued to cheer for her success, even after a month of the same. I eventually got a chance to talk to the class while she was visiting the school counselor, and explained to them that I knew that the system was unfair, but she clearly needed the stamps and they really did not. I gave them stamps and stickers and rewards as much as I could, but they seemed to understand that their classmate had a problem that made her situation different, and they accepted it as really only children can. If only adults could be that understanding and accepting of differences! After about a month, I started to see if perhaps the child could go a bit longer than five minutes. I started to ask her, “Can you go six minutes today?” “How about seven?” Eventually, we made it up to ten and then twenty minutes! I was careful to ask her how she was doing, and if she said she couldn’t make it more than five minutes, I accepted that and set the timer for five minutes. She seemed to understand that I was trying to help her be successful, and we were working together to make that happen. But still, there were many, many, times when I had to restart her timer. It was a much better consequence for her than attempting to put her in time out, which wasn’t helping change her behavior anyway. And the school counselor still helped her a lot. By the time Easter rolled around, she almost never needed the timer anymore! We just put stamps on the contract for each instructional period of the day when she had behaved well. I am sharing a more “generic” version of that contract with you here today that I am hoping might be useful to some of you. This child’s story ends well! 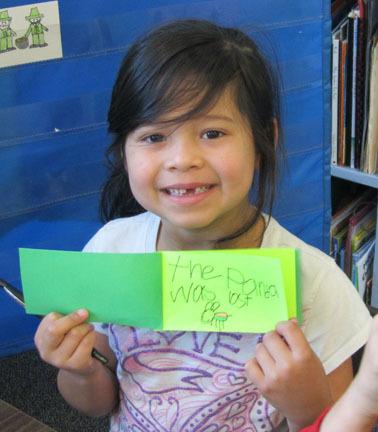 She rose out of the low group and learned to read and write fairly well by the end of her Kindergarten year. When I think back on what we went through during the first trimester, her academic and social progress is nearly unbelievable. She started Kindergarten with no letters, sounds, numbers, or social skills to speak of. She went on to become a successful first and second grader with (mostly) normal behavior patterns, having made more than a year’s progress in reading and math over the course of the two trimesters that her behavior was finally under control. A situation that seemed like a curse to me became a mother’s answered prayer! And I myself learned some valuable lessons on helping a child reach her potential both socially and academically. There were times when I could see that something bad had happened with this particular child before school or the night before, and that she appeared to be headed down a very self destructive path. I could only wonder what had caused this, but it appeared that the stamps and the timer were not going to help. So rather than let her spiral down into a situation where she might wind up hurting somebody, I decided that it would be better to invite her to do something else. Fortunately for me, she was very artistic and enjoyed coloring. I decided to make her a little book to read and illustrate in situations such as these. The words to this book form a “Social Story,” in which she would read be reminded of what her strengths were and what the class rules were. Then it reminded her of the rewards that she would gain if she were to follow them. At the end of the book, I even added a bunch of pages that said, “_____ is smart!” “____ is good!” “Mrs. Butkus loves ____!” “Hooray for ____!” Anyway, the procedure was that she would sit with someone (usually my aide or if available,) read the book aloud to the best of her ability, and then illustrate herself being good on one of the pages. If no one was available, she read it alone and then proceeded to color. 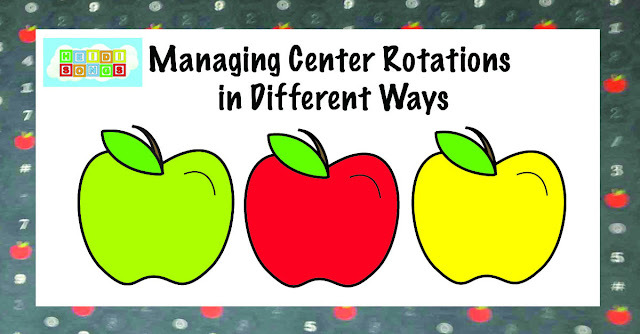 In any case, it was a sufficient enough of a distraction for her to redirect her out of the unwanted behavior pattern until we could get her into our small group rotation, which was generally a very successful time for her. I am including a “generic version” of her Social Story for you as a download today, though I would say it is likely that if you wanted to use it, you would have to retype it to include the specifics of your own situation. 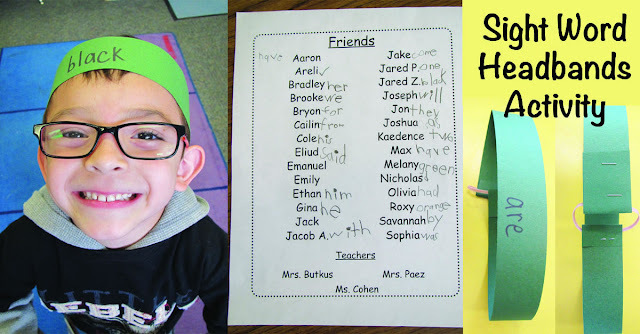 I think that it is important to mention that I am not the one that came up with the idea of having her read aloud the “Social Story.” A few years previous to having this little girl in my class, I had a little boy who had ADHD, and he had a therapist that visited him weekly. She gave him one of these little stories to read aloud to my aide when he needed redirecting and reminding. But I figured that he would like it better if I made it into a book that he could illustrate, so I retyped it and bound it into a little book for him. But this little boy actually hated his book! My aide called it “____’s Credo,” and he was so smart that he actually had it fully memorized and inserted things such as “I have to raise my STUPID hand” rather than “raise my hand,” as it was written. :) At the time, I had no idea that this sort of thing was referred to as a Social Story and is a rather commonly used technique for special needs children. I learned this last year at a conference somewhere. Oh, wouldn’t it be nice if they could cram all of the information that we need into our heads when we learn to be teachers, right from the start! But alas, that seems to be just about impossible. We learn as we go along, through trial and error and from the teacher next door. And now too, we learn from the occasional web page or blog or two! 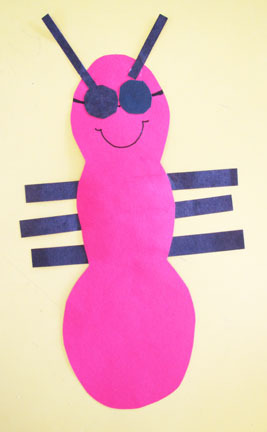 Today, I am giving you the pattern and instructions for the ant that was shown marching around the bulletin board with last week’s leprechauns We do this ant every year, and as art projects go, this one is pretty simple and doesn’t take much time at all. Of course, every time I teach about an insect, I read about it in both fiction and non-fiction books. And later this year, when it gets closer to Open House, we will get out my ant farm and order a refill of little ants and watch them go! I also have a Ladybug Habitat and a Butterfly Habitat from Insect Lore (http://www.insectlore.com/) that we use and enjoy each year. Last year, my timing was off on when the insects would hatch and mature, and they were all dead by the time Open House came along. The only thing still alive were our chicks! (YES, we have an incubator, and I intend to hatch some chicken eggs again this year, just in time for Open House!) The children get incredibly excited about the whole thing, and although sometimes it creates problems, I do think it is worth it. Last year, I collected five dollars per family as an optional donation to help pay for insect larva and tadpoles. I got bullfrog tadpoles at a local pet store, because I have had terrible luck with Insect Lore’s tadpoles, unfortunately. They tend to die quickly. Plus, they are also so small that they are hard to see. We even had a praying mantis egg sac, but they didn’t live for more than a few days, because apparently I couldn’t keep up with their voracious little appetites. The problem was that there were approximately 75-100 baby praying mantises! I should have let most of them go, but I was reluctant to do that when I knew that other classrooms might enjoy them. So I sent out an email asking the other staff members who wanted them. I gave away most of them, but all of them died within a week, no matter whose classroom they were in and who was feeding them. Boo hoo! I’m not sure if I want to try THAT one again. If anybody knows the secret to keeping these little critters alive, (even just a few of them) I would love to know about it! In the past, I have also had meal worms, but found these to be a somewhat uninteresting type of critter to keep in the classroom. We had a worm kit from Insect Lore as well, but the worms were rarely visible, and it just wasn’t worth the trouble. The butterflies, ladybugs, and ants are always fun, though. 4. Five Minutes of What? Our school recently adopted a new system of discipline created by Accountability Concepts. ­­ In this program, the children are held accountable for their behavior and are expected to find ways to make up for things that they have done wrong. Their behavior is represented in a “Pyramid” that each child has on the wall. Kindergartners have two pyramid pieces: one for self control, and one for responsibility. A child that is not following the rules of the school loses a “Pyramid Piece” and therefore does not get to participate in anything fun that the class does until he or she finds a way to make amends for the poor behavior. This can be hard to do in Kindergarten, since the only thing that most children can think of to do when they have wronged another is apologize. (And let’s face it; often, they don’t seem particularly sorry, other than sorry to find themselves in trouble.) I sometimes have them write letters of apology, draw pictures of themselves being good, or help that person clean up toys, etc. An important feature of this program is called “Five Minutes of Fun.” Each teacher is expected to stop everything and do something fun with their class for a few minutes each day. The children who have a piece of their pyramid down do not get to participate; they have to just sit and watch. It has of become a sort of tortuous time out, since they have to watch the other children doing something really fun while they just sit and watch. The hard part, of course, is thinking of something really fun and quick that you can do on the fly without losing control of the class. The Behavior story is amazing and inspiring! Ive never gone that far to do them every 5 minutes but have had children on a simpler smiley chart. They start getting smilies - about 8 per day. Then 4, then 2, then hopefully 0! Happily, ive used this with several children and its worked! They are so excited to be "off the chart" by the time they go to Kindergarten. I also created a chart for a little girl one year who was very negative. So we created a chart where we would write down positive things she did during the day and negative things. If there were more positive things than negative, she got a sticker for her chart. When she got 5, she got to go shopping! I attended Michael Heggerty's session as well, on the advice of our Kindergarten teacher who uses the blue book. I was interested in the new Pre-K program (the purple book). 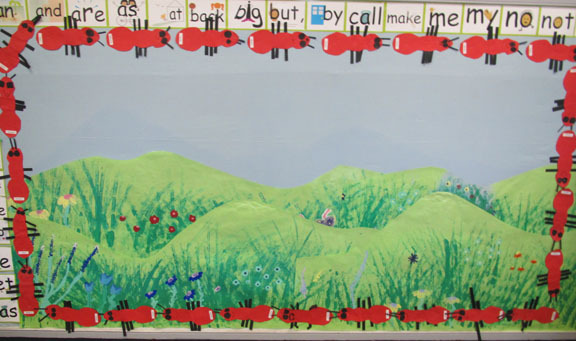 Im seeking out the advice of Kindergarten teachers. 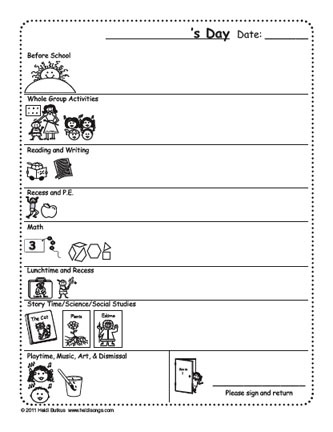 Using the program, do you think the Pre-K program would help before moving to a K class who uses the blue book? Well, I am not familiar with what the new pre-k program really looks like. I was about 15-20 minutes late to the session because I was "minding" my exhibit booth and was afraid to leave it unattended. So if they talked about it at that time, I missed it. I would venture a guess that his pre-K program would be excellent! My district has all adopted his K phonemic awareness program, and today everyone was raving about it! From what I can tell its pretty similar to the K program except that you work with a designated nursery rhyme (from what I can tell in the Kindergarten book youre not given a specific nursery rhyme each week) and there is an optional center activity that goes with the nursery rhyme. Youre still doing the chopping and the blending and all that stuff. I think the time period is shorter too. I dont blame you for being afraid to leave your booth "unmanned". Ill bet you sold A LOT of stuff after your sessions. ;) Im still debating on which DVD to get next - letters or Sight Words Vol 2 for the color words. Probably both! We learn 29 and 30 next week so we need new songs to learn! From what I can tell the purple Pre-K book is pretty similar to the Kindergarten blue book except that the time period is shorter and there seems to be a designated Nursery Rhyme (I was lead to believe that there was not a specific nursery rhyme chosen for the week that is up to the teacher); Also there is an optional center activity that goes with the nursery rhyme. I LOVE the social stories, what a great idea! I also like the contract you created. Is the contract for just one day and you have a new one each day? Does the child put the stamps on the blank lines next to the pictures? Thanks! The contract is for just one day at a time. The child gets a new contract for each day. The child then puts the stamps on the blank lines next to the pictures when he or she has been good during that time. I also wrote notes in that space if there were issues during that time as well that needed to be reported. Your story really touched my heart. It seems more and more children need help with controlling themselves and behavior. I have several special needs students in my class. Timers go off all the time. What I have found the most amazing is to watch my other students accept them for who they are, praise them for their learning and to love and accept them. I have just revamped my behavior management for my 1st grade class. I have to say this is the class that's had me thinking about retirement--a lot of high fliers! I went to a 'card' for each child. They are weekly cards with 3 areas: Be safe, Be respectful, Be responsible with a place to mark for each day. I'm hoping that will weed out a few that otherwise would need a daily chart for more difficult behaviors. I am happy to say that I will be able to celebrate the positives and hopefully eliminate the negatives. I love the idea of social stories. I will be adapting that one too. I appreciate your willingness to share and am happy to see that I'm not the only one who is given extra opportunities to learn along with the children! My students love your CD's. They often beg me for your songs each morning and I love to read your blog each week. I particular found this week very helpful. Thanks for sharing how you dealt with one particular behaviour difficulty. Could you share more on how you actually run Michael Heggerty's program? We're now into about week 4 of his program. Some students are catching on quite quickly, others just seem to be repeating mechanically, without really thinking about what they are doing. We try and make it as interesting as possible and use props for each section. e.g. a coloured band around a child's left hand when we are blending together the compound words. The child says the first part of the word by placing their left arm on the table and then they say the second part of the word with their right arm. They then join their two hands together to blend the word. With the sentences at the end, which the students repeat, we have interesting shaped fly swatters that they tap on the table as they say each word. How long have you been using this program and what success have you experienced? Did Michael Heggerty have any other wonderful suggestions? As far as Michael Heggerty's program is concerned, I only use it in a whole group situation, though I like your idea of using the manipulatives with it. I would do that if I were using it in a small group. I call it "Guessing Games" and the kids usually get really excited about it. BUT there is a lot of shouting out of the answers and things like that, so it is a noisy time of day. Since we do the SIPPS phonics and phonemic awareness program in our small groups, (we have to as per our admin,) a lot of the same material gets covered there. So over the last trimester I found little time for the Heggerty program. Our third trimester begins on Monday, and the kids will start staying for their full day then- until 2:15. (Previously they dismissed at 1:20, except for a small tutoring group that stayed until 2:15.) So I will have more time for the Heggerty program then. I am looking forward to going back to it more regularly, because I find it extremely useful and the kids usually love it. As far as tips are concerned, when a child calls out a correct answer, I try to point to him or her, call out their name, and say, "Good job, ____!" Then they are all really motivated for that to happen. I also add hand motions to it. Example: When we segment compound words, I put out one hand and then the other, and they know to say one part when the first hand goes up, and the other part when the other hand goes up. If you send me your email address, I'll send you Michael Heggerty's handout from the session. I'm still amazed at the amount of comments coming in on this posting! Keep them coming! I think that the more ideas we have to work with, the better. Please send me any and all ideas you have for dealing with behavior problems, (or really anything else) that really works for you! We all want to know! As they say, "Great teachers are not born; they learn from the teacher next door." I LOVE the social story. Also, the contract that I believe will help one of my kiddos. I receive many "challenging" children in my room for some of the same reasons, but also because I just don't give up on them, when many others do. I have a child that moved to my room a month ago because of behavior issues. He has already made progress but I think the contract is perfect for him. Thank you for posting your story and ideas! You are an amazing teacher and I appreciate all that you share with us! Hi Heidi, your site is really great! You have delicately chosen topics that suits every mom has been looking for. By the way, you seemed to be a very good teacher (Just a comment...). Anyways, children with behavioral problems really could make or break a day. Most of us moms knows that children are very vulnerable in various influences: media, bad play mates, etc. For those that really had some hard time to address this, I would suggest you send your children to boot camps. Why not give it a try. Have a nice day Heidi!